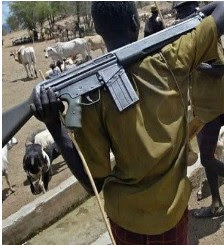 The Governor of Benue state, Samuel Ortom of has reportedly urged the people of the state to adopt any lawful means to defend themselves from the killer Fulani herdsmen. The Benue state Governor who lamented that the call became necessary for him after the Inspector General of Police, Ibrahim Idris who was suppose to enforce security and safety of Nigerians kept playing politics with the unending killings in the state. “The Police said they arrested Livestock Guard members and termed them a militia group from Benue. It’s just a diversion from the main issue. “If you want to hang a dog you give it a bad name. That is what the Inspector General of Police is doing, he is the mouthpiece of Miyetti Allah Kautal Hore. That is what the man represents. He should therefore resign his current position to serve full time in his new job. “So bad, they plant weapons on people and take their pictures and claim they are Benue Livestock Guards. Those people are not members of our Livestock Guard. It is just a planned thing. “The fact is that I am facing a lot of intimidation and blackmail but I am firm and strong because I have trust in God. “There are threats even on my life, they are on record that I reported to the Police and those people responsible have not been arrested. “People say they are going to kill the Governor, is that not grievous enough to arrest the people concerned?